But enough talking about it, let’s take a look at a template project folder.The folder shown below is the template that we use for every job. New jobs are assigned a job number and title that stays with the project all the way through. The template folder is copied into the active projects folder and renamed to reflect the project name. As you can see, there are pre-made folders for all of the different assets that most jobs need. Not every folder is used on every job, but every every possible asset has a home. So when it comes time to save or open any type of file, there is only one (maybe two) places it can be. And receiving elements from the producer is a snap as well. If the producer hands you a memory stick with photos, VO and a script on it, it’s pretty easy to figure out where to put each of them. And while you could create these folders as you go, it saves time and preserves consistency by having the same folder set for each project/editor. In our project folder, all of the projects come together nicely. Here is another benefit to consider. When the project is done, approved and in the can – it is very easy to backup the project and all of its assets (excluding captured media, which we don’t save as part of the project) to a DVD, HD or LTO tape. We always do a full resolution QT export of all final edited pieces (that go into the FCP Export folder) and what we end up with is a nice tidy package of files that can easily be backed up for future use. Another great benefit to using the project number system is removing all elements related to a project. My normal procedure to remove a project once it’s safely backed up, is to search all media drives locally and on the network for the job number. This finds the project folder, render files, captured media, auto-save vault files, and anything else tied to that number. From the find window, I then do a select all and delete everything. Couldn’t be easier. But let’s take it one step further. 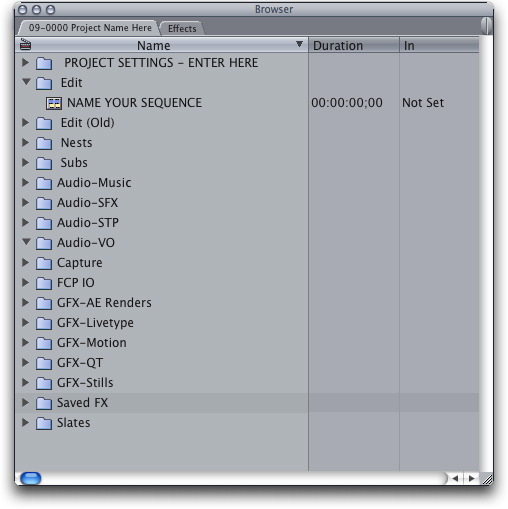 The project folder is great, but how about organizing your FCP project file and have that as part of the folder? I found I was always creating the same folders over and over again. While it doesn’t take that much time, it does add up over the years. Take a look at this FCP project. This is how every job starts out, and again, has many pre-made folders to get started. Also notice the very top folder in the project. Long gone are the days of one video format fits all. The simple days of everything being on BetaSP and working in NTSC are gone for good. Our jobs range from DVCPro to full resolution 1080p uncompressed HD (we’re still waiting for our first RED project). So every project has to be setup properly based on the project needs. Even if the project was shot in HD, we don’t always edit in HD, it all depends on what the final project needs are. One way we communicate this to each other (and as a reminder to ourselves) is to rename that top folder with the project specific settings. Then if you open the project to do some work you just run the associated Easy Setup to set the edit system up properly. Once a year (usually around this time) I go through both the project template folder as well as the FCP template project and make minor changes as I see fit. If you would like to give it a try, below is the link to our current template folder. If you’re interested in more tips on keeping your projects organized, shoot me an email. Is Your MacPro Louder Than Your Audio Mix? Looks like a great site and resource for me and anybody out there in our field. I’ll pass it along to many. I think we may want to add a link on the CHIFCPUG website. I’ll bring it up at our next board mtg. This article rings true to me. I have always tried to stay organized, buy my methods have changed, and frankly not consistently. Your template folder is great, and I will look it over and seriously consider using it, or a derivative. I also like how you must start each project with a template project that sets the bin structure. Nice time saver. Particularly good when you start using it a few times, I’m sure, ’cause you know where to look for the items. Keep the articles flowing. Thanks so much. Question: I watched Jeff’s ITunes video tutorial. What screen capture program are you using? What is it encoding to… looks fantastic! Hey, great idea to have such a template. I used to bring some logic into my projects, but never went so far. I would really like to know your workflow underneath. I don't get why there are 5 different DVD-folders, what Labels, Logs Scripts and Slates are for. And what the heck is Audio-SFP? Maybe, 'cause I'm German, but I would appreciate a litte explantion for each folder. As I'm writing, where do you store your Media-Files? For a while I tend to ignore the FCP-Capture Scratch and import my tapeless media into the project folder. What's your file-storage? I don't get the usage for each folder. Maybe 'cause I'm German, but I would really appreciate a litte explanation for every folder and every FCP-folder. And I'd like to know where you store your MediaFiles. For some time I abandoned the FCP Capture Scratch and save my footage inside the project folder. How do you store your media in relation to the project? Keep in mind that how we organize our projects and what makes sense or works for you can be two totally different things. 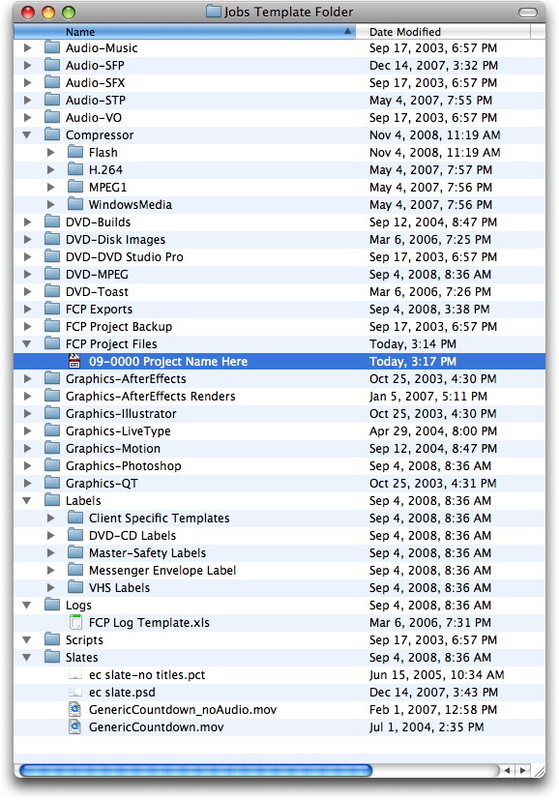 It's more the idea of having a template folder, then the specifics of what is in the template folder that matter. 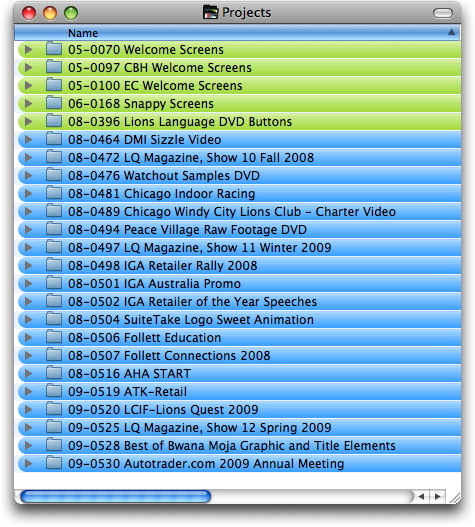 There are multiple DVD folders because the process of making a DVD involves those different steps. By starting each folder with “DVD”, they are all grouped together automatically in the list. Logs = Tape logs provided by producers. That can be a FCP project file or an excel document. Scrips = The actual script for the video. We sometimes copy and paste CG information from the document directly. As for the workflow itself, I'm actually almost done writing a post that goes into great detail on how we handle everything from start to finish, so keep a eye out for that. Should be up in another week or so. Hi Just got an e-mail about this and will definitely check it out.